Played a little Ignition Casino $100 NLHE Super KO while watching the broadcast recaps of the PokerStars Caribbean Adventure Main Event from last year. Last hand I played 5♥6♥ flopped Tx5x6x and managed to get it all in against jacks, then the board paired the turn eight on the river and I was out without so much as a bounty after 35 minutes. The end of the day was the Final Table $2K GTD NLHE. I got to the club just before the first break and got sat in between the blinds, so I didn’t play either of the last two hands before break, late-regging despite my better judgment. I got aces on my seventh hand (there were only 7 players at the table) in the small blind. Aces in the small blind again at the beginning of my second level of play. I was below average but considering that nobody had busted completely after six levels (half the players had rebought before the break), I was doing fine. I got queens in the small blind and took hand with an all in. A pair of jacks was where things started to go wrong. A couple of the stacks were getting short, one went all in for about 8bb in early position, I shoved with the jacks to isolate, but the small blind woke up with kings. The short stack made two pair with Ax9x, and I was down to about 6bb. I managed to survive through a couple of punishing big blinds (shoving 2♥4♥ and showing, at one point) then Dave—one of the aggressive players at the table—min-raised at the 1200 big blind level. I only had 3300 but I had a Mutant Jack hand: A♣J♣ and shoved. The player whod had the kings shoved over the top from the small blind (again) and Dave called with deuces. The small blind had 9♣8♣. The flop was jack-high with two spades, putting me in the lead, but the board ran out a backdoor straight for the small blind. Congrats to Ryan Stoker for taking sixth at one of the opening events of the WPT Five Diamond at Bellagio this weekend! And condolences to Darin Stout who had a good Day 1 in the Wynn $250K GTD NLHE but ran into some trouble on Day 2. 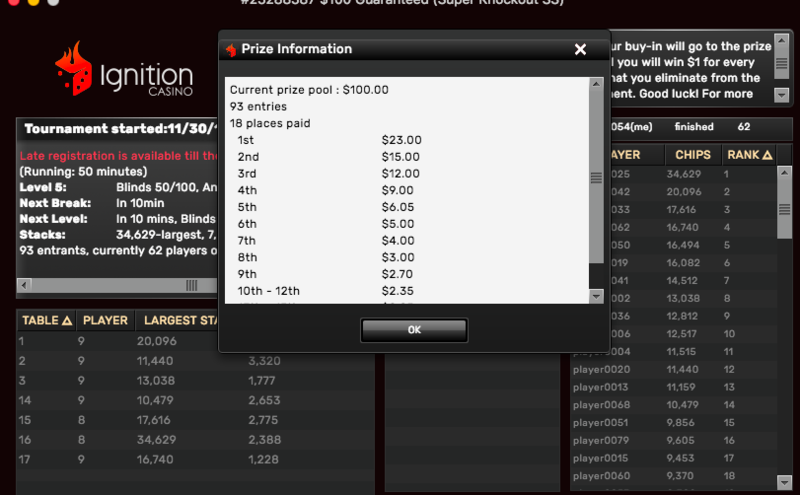 This entry was posted in General Poker, Live Games, No Limit Hold'em, Tournaments by Poker Mutant. Bookmark the permalink.